The pre-credit sequence of Homefront has Phil Broker (Jason Statham), an undercover DEA agent who has infiltrated a biker gang, taking down a meth operation. The action is edited so fast and furiously it is tricky to tell exactly what is happening—perhaps to provide some identification with the characters? But then a slow-motion shootout has Jojo (Linds Edwards) murdered by the cops, and his father headed for prison but out for revenge. Two years later, Broker and his daughter Maddy (Izabela Vidovic, terrific) are trying to live a quiet life in a rural Rayville, LA. Dad gets called in to school when Maddy defends herself against a schoolyard bully. The fight between the kids starts a feud between Broker and Jimmy (Marcus Hester), the father of the boy Maddy bloodied. The feud escalates when Jimmy’s wife (Kate Bosworth), asks her brother Gator (James Franco) to teach Broker a lesson. Franco plays the film’s villain, a meth-maker with his sly gonzo appeal, a distant cousin to his loopy character, Alien, in Spring Breakers earlier this year. Gator munches on potato chips almost innocently in some scenes, but then he gives the film a nice jolt as when he threatens meth-heads who are muscling in on his local business. He is almost comic when screaming at his “meth whore” Sheryl (Winona Ryder) when she kidnaps Maddy in a plan that turns into a goat rodeo. 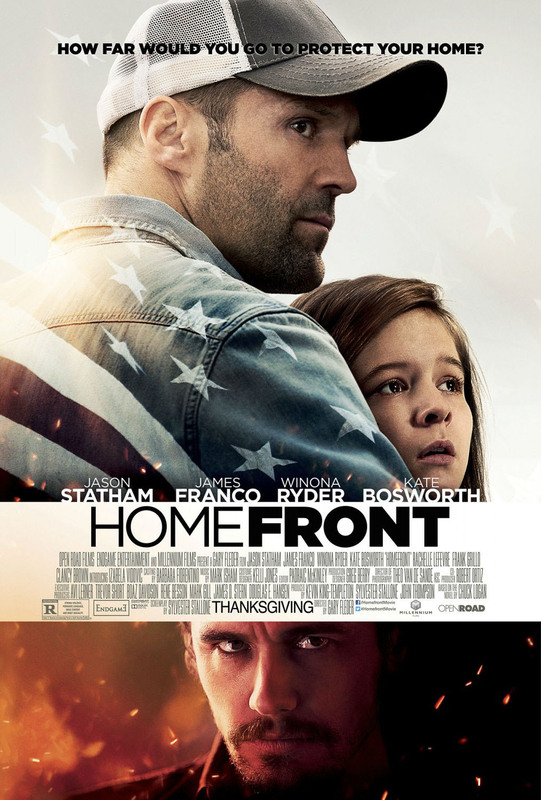 These moments are enjoyable, but the real ace in Homefront is, of course, Statham, who mixes tender scenes of Broker being a caring dad and tough scenes such as a gas station altercation involving some of Gator’s thugs. Statham exudes his typical grace under pressure throughout the film, even when he’s fighting goons with his hands tied behind his back—as he does in one of the film’s more exciting action set pieces. While Homefront is engaging, it is a pretty traditional, and unsurprising story. It has the feel of a modern-day take on a classic Western: a lone stranger comes into town, mixes things up, before making everything right. Sylvester Stallone, who adapted Chuck Logan’s novel, wrote the screenplay, and it is distinguished by an uncountable number of uses of the F-word. While there is a nice wrinkle that a few meth-headed characters reconsider their evil ways. Statham fans, however, will care little about such character development. It’s all about the action, and with that criteria, Homefront is pretty satisfying. Homefront opens today in Philly area theaters.